After having repeatedly been the location of renowned exhibitions in the past, Baden-Baden is once again proving itself to be a location for international art. 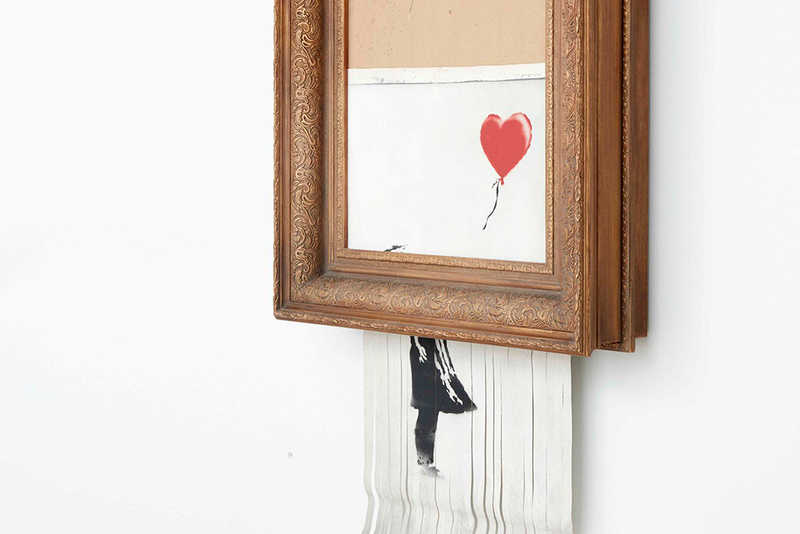 The Museum Frieder Burda presents the world’s most prominent work of 2018 between the 5th of February and the 3rd of March 2019 “Love is in the Bin” by street art artist Banksy. In autumn 2018, the framed picture “Girl with Balloon” of the British artist from 2006 was auctioned at Sotheby’s London for 1.2 million euros. After the contract was signed, an automatism in the framed work started, shredding the picture halfway and putting the auction on the international stage. Although the motive of this action of Banksy is not completely cleared up, the interest increased. We are very pleased that this absolute rarity is now being shown to the public in Baden-Baden for the first time. Embedded in a comprehensive symposium, the Museum Frieder Burda plans to bring the exhibition into an overall context with the artist. For those who do not come from Baden-Baden, the Roomers offers the special package “Shred Love”. 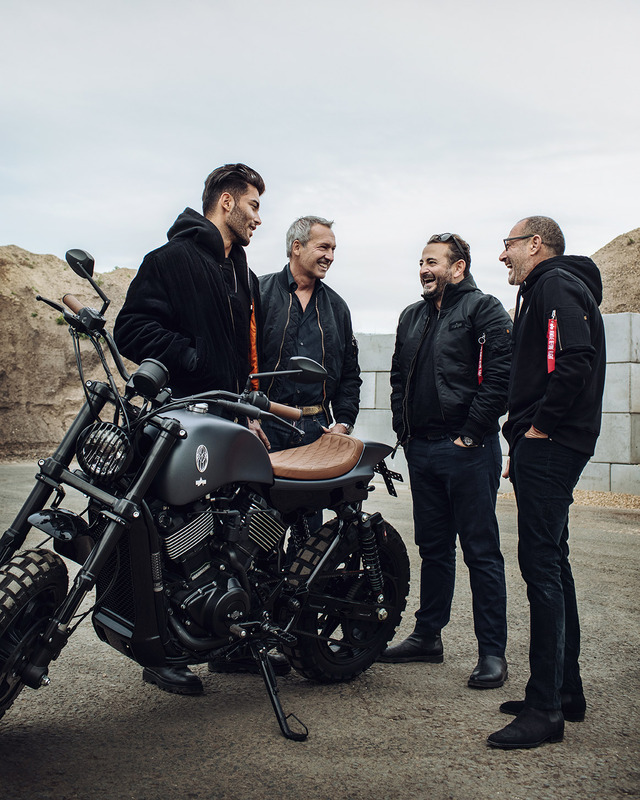 An individually designed edition of the Harley-Davidson XG750A Street Rod is the new milestone of Micky Rosen, Alex Urseanu and the owners of Alpha Industries Europe Rainer Knapp and Norbert Schneider. Only 20 of the bikes are produced – the edition is as limited as a few before. The cooperation is another highlight for the four entrepreneurs, who are driven by the same spirit: the lightness of being, the constant pursuit of the extraordinary, and in doing so, overcoming new boundaries. Fittingly, the four won artist and model Toni Mahfud over, who will present the jewel to the outside. Among others, Toni already modeled for Dolce & Gabbana, Moncler, Hugo Boss, Calvin Klein and G-Star. He embodies the same spirit that unites Alpha Industries and Roomers, making him the perfect “Friend of the Brand” for the limited edition Harley-Davidson. He was photographed by the well-known, internationally working fashion and beauty photographer Lina Tesch. A meeting of true connoisseurs and style poets. We both share the same passion for the culinary art and philosophy, for perfect drinks in special places and for living in the moment. The result is an exceptional tonic water – Gekko Monaco – created together with the bar managers of Gekko Group. All ingredients are 100 % natural, vegan and certified organic. The only exception is the cinchona bark that is typical for tonic water and which is gathered wild from Bolivian forests. Innovative recipes are the specialty of both enterprises. No surprise then that after lengthy testing, ingredients such as turmeric, mint, orange and pepper have emerged as features that make Gekko Monaco tonic water something special. No place here for artificial aromas and preservatives. Aqua Monaco describes the tonic water “super balanced” and “smooth oriental”. And there’s another untypically tonic water feature: Gekko Monaco can be used as a stand-alone product, it can be enjoyed without gin or any other spirit. Alex Urseanu and Micky Rosen are already looking ahead: the drink is the first step we‘ve taken and even now we can feel the energy that will lead to a lot more ideas becoming reality. It’s a really big deal”. At the Mixology Bar Awards gala ceremony held in Berlin on Sunday 7th of October the coveted black glass trophies were awarded in 16 categories. The Provocateur scored a double hit as Hotel Bar of the Year and Bar Team of the Year awarded to its team. This puts the Provocateur Bar up with the best from Germany, Austria and Switzerland. Our entire team is incredibly proud! The Provocateur Bar follows the concept of the award-winning Roomers Bar in Frankfurt. It’s the hotel’s heart and soul and symbolises a unique bar culture. The burlesque atmosphere of the interior is reflected in the bar menu, which was also shortlisted. The 12 signature cocktails were created by bar manager Tarek Nix and his team and take their inspiration from celebrities from the 1920’s and from the history of the hotel. An individually matched food pairing gives drink a finishing touch. With the first Roomers in Frankfurt, we made a lasting impact on Germany’s hotel industry. Now we look forward to a second Roomers hotel in our hometown, the Roomers ParkView! 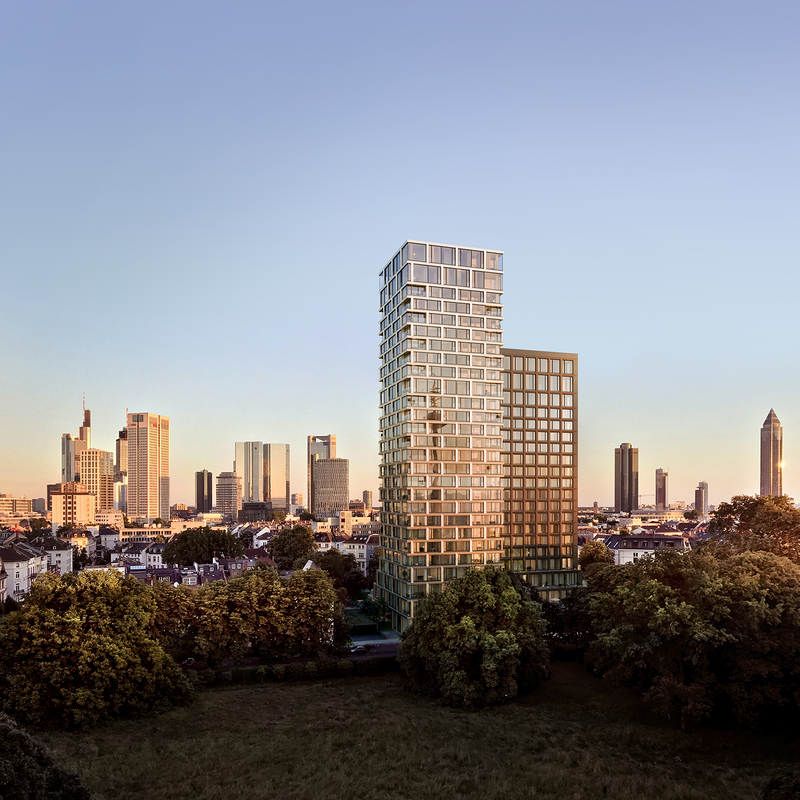 With 136 rooms and suites, it is expected to open in Frankfurt’s Westend at the end of 2020, overlooking the Grüneburgpark and Frankfurt’s skyline. The hotel will focus on suites and a special food & beverage concept will, as usual, be the focus of Roomers ParkView. The 19th-floor bar will overlook the skyline, and the 18th floor will be home to an exclusive Roomers Spa. As in Roomers in Baden-Baden, we were able to win the Milanese star designer and our longtime friend Piero Lissoni for the interior design. The total project comprises two buildings, the hotel tower will comprise 19 floors and another tower 26 floors. This is where high-class apartments are built, which also can take advantage of Roomer’s service. Project developer and landlord is a joint venture of RFR Group and Hines. With Aby Rosen and Michael Fuchs, Alex and Micky are already working together successfully in the first Roomers. The project developers and we were accompanied in the negotiations by the law firms HauckSchuchardt and Hogan Lovells. The fact that the Black Forest with its mountainous landscape is particularly suitable for biking makes outdoor fans especially happy. One more reason to get a cooperation partner for outdoor equipment in Roomers Baden-Baden on board! From now on, two e-bikes and four mountain bikes from HEAD are available for all the Roomers guests to use for free. For 25 years, the sporting goods producer has been enthusiastically combining technology and trends in biking. We wish you all the fun on the next Black Forest tour! At Roomers Spa in Baden-Baden as well as in Roomers Spa by Shan Rahimkhan in Munich we’re proud to be partners of Comfort Zone. Here you can find a line of the most modern skin care products, which all are produced sustainably in Italy. The development of this professional skincare focuses on research, but also on quality. All of its ingredients are of natural source and are combined with high-tech molecules in such a way that every use is not only effective, but also extremely pleasant. That’s why Comfort Zone products are very popular in the spa area and had even won an award. Two experts. One Guideline. UND GRETEL. We’re so proud to present our new beauty partner at Roomers Spa in Baden-Baden! Make-up, free of synthetics with natural ingredients at the highest level of perfection in application, effectiveness, and durability: This is the spirit Christina Roth and Stephanie Dettmann followed when they founded their Berlin label for professional and long-lasting organic cosmetics. On the high-quality and elegantly designed items of UND GRETEL, their focus on sustainability and natural ingredients is displayed and not their outdated image of compromise. The founders, who deliberately limit their product ranges, describe them as the “little black one” in the wardrobe: essential. After all, that’s what matters with the right product. We are so so happy to announce our new Spa partner in Roomers Baden-Baden: Dr. Barbara Sturm.The Düsseldorf native, Dr. Barbara Sturm is one of the most successful derma care physicians worldwide. Her success comes from her treatment methods and the own-body remedies. Her expertise in numerous aesthetic but non-operative treatments, has led her to become the leading expert and to create a skin care line called The Molecular Cosmetics. The extract from the purslane plant is unique in the cosmetic field: The enzyme telomerase, known as the fountain-of-youth enzyme, is activated in the cells by the plant substance and thus contributes to the fact that key cells increase their viability. This, combined with other highly innovative natural and research ingredients, make Dr. Barbara Sturm’s skin care products internationally unique. Germany’s first spa by Shan Rahimkhan! Roomers in Munich is enriched by one more attraction: The Roomers Spa by Shan Rahimkhan is opened with more than 600 sqm, a large Jacuzzi with cinema screen, intimate seating niches, sauna, hammam, a bar and five treatment rooms. In addition to the “True Beauty Lounge” by Shan, hotel and day spa guests can look forward to beauty treatments with products from Shan’s product series. Another highlight on offer: Hydrafacial treatments. Shan Rahimkhan opened in 2005 at Berlin’s Gendarmenmarkt on 800 sqm his eponymous concept store with Casa, Coiffeur and Café, today’s Shan’s Bistro. In 2010, the own haircare line “Shan Rahimkhan True” was added. Only two years later Shan opened the second location on Kurfürstendamm. “Shan’s True Beauty” with fast hair, make-up and nail service “to go”. Since May 2018, the first spa by Shan Rahimkhan is now in Roomers Munich. Under the motto “Share”, a Wine & Dine Charity evening took place at Gerbermühle in aid of children suffering from cancer. Frankfurt e.V. Friend and partner of the Gerbermühle Philippe Spasojevic, from the wine company Villa Hoechst, based in Eltville am Rhein, brought along three wineries and great wines for tasting. The winemakers Anne Dönnhoff, Markus Schneider and Friedrich Becker presented in large bottles up to 6 liters next to others a Riesling named Dellchen 2013 GG, the Steinsatz 2014 and a Chardonnay Mineral 2009. Correspondingly Jörg Ludwig and his team spoiled the guests with regional delicacies, quite to the theme of the evening inFamily Style, say to share, “just like at home, in bowls in the middle of the table “. The hosts Micky Rosen and Alex Urseanu are pleased about the successful evening and the nice donation that has come together. Since 1990, personalities who have made outstanding contributions to the hotel industry have been honored by the AHGZ and the dfv media group. Alex and Micky about their recipe for success: “We have it in our heads and put it into practice The joy of making people happy has led us to move on and to go to other cities. At the end, it’s all about life, love and passion — and the pleasure of sharing these together.” We are incredibly proud of this award and thank all Gekko Group teams, our families, friends and partners – they are all part of the story! Gekko Group has been awarded twice! Roomers in Baden-Baden and Provocateur in Berlin are proud winners of the German Design Award 2018 in the category Interior Architecture. The German Design Award, initiated in 2012, is one of the most recognized design competitions in the world and enjoys a high reputation far beyond the specialist circles. Its aim: to discover, present and excel in unique design trends. The German Design Award is awarded by the German Design and Design Authority. Its primarly mission: to represent German design. Founded in 1953 on the initiative of the German Bundestag as a foundation, the company supports the economy by consistently achieving brand value through design. This makes the Design Council one of the world’s leading competence centers for communication and brand management in the field of design. Apart from business associations and institutions, the exclusive network of the members of the foundation also includes the owners and brand managers of many well-known companies. There were over 5,000 submissions including 758 from abroad who applied for the German Design Awards 2018. Micky Rosen and Alex Urseanu were awarded as the “Gastronomes of the Year” by the renowned magazine Rolling Pin. In total there were 14 different categories. With more than 9800 votings, they are not only one of the most sought-after awards, but also the most recognized awards for the German gastronomy and hotel industry. The two Gekko visionaries are extremely proud of this recognition, which they also dedicate to their employees of the Gekko family. Kai Stuht’s philosophical ideas are reflected in his campaigns and artistic works. He started as a sports photographer, set new standards and thus changed the approaches of large fashion campaigns. He was always on the look-out, did not want to adapt, only in the development of his artistic work he found his fulfillment. He was not satisfied until he found his own very individual and artistic style. He is something like the David Lynch of the European photographer scene. His dramatically staged picture worlds appeal to the subconscious, it is impossible to escape this magical pull. His light guide is unmatched; with the precision of a Hannibal Lecter, he is dissecting his motifs and reassembling them in new meanings. With great sensibility, the electorate unmasked the icons of the entertainment industry, layered by layer from their tank, and as a result, received this rare look at the man behind the public figure. That’s what makes it unique. Stuht is completely unimpressed by the elitist codes of the feuilleton, he avoids the red carpets like the devil the holy water. In almost autistic retreat, the philosopher is among the German star photographers on the tapestry of his life. Unique. Unlimited opportunities. A Member of Autograph Collection Hotels – exactly like nothing else. As the third hotel of its brand, Roomers in Munich takes the distinctive Gekko spirit into the Bavarian capital. Atmospheric interior combining design and warmth, a Roomers Spa by Shan Rahimkhan with infinity Jacuzzi and cinema screen, and Roomers Bar with the exclusive Red Room, a hideaway with daily changing beats. We are happy to introduce the restaurant IZAKAYA, a modern inspiration of a small traditional Japanese restaurant. The cuisine: Japanese influenced by South America. 27 Apr A lot of Schweinerei. Duc was born in Hanoi. His mother is Vietnamese and his father was Chinese. “I started my career early, in my mother’s kitchen. I watched my aunts and uncles cook and was always interested in food.” Early in his childhood, his family was forced to leave Hanoi and ended up in Hong Kong. There, they were then given two options for emigration—West Berlin or Chile. In the winter of 1979, Duc’s family arrived in West Berlin as part of a group of 200 refugees. He was just six years old. 27 Mar Berlin here we are! Hello Berlin! Here we are! Provocateur is the burlesque brother of Roomers and can be found at Berlin’s most beautiful west. A „Member of Design Hotels™“ with a playful sensuality, a tribute to Paris of the 1920s and bridges between Oscar Wilde and Edith Piaf. 58 rooms, a bar and a event location in the basement as well as the Golden Phoenix restaurant operated by our partner and friend The Duc Ngo (among others: 893, Madame Ngo, moriki) offers a perfect surrounding to explore the city and is a new favourite spot for locals. We are proud of having Saskia Diez for our exclusive jewelry collection for Roomers. Saskia Diez is a jewelry designer based in Munich and shapes unique materials in refreshingly modern ways. By confronting everyday materials with traditional fine jewelry, she connects her pieces from today with ideas from tomorrow. Thanks for that lovely new collection, Saskia! Finally: The new Roomers opens in Baden-Baden, close to the famous Festspielhaus and in the middle of the Black Forest. The first design hotel in town is also Germany’s first hotel designed by Piero Lissoni from Milano. 130 rooms and suites, a wellness area with spa and gym, a Roomers Bar and Rooftop Bar with infintiy pool, a pan-asian restaurant moriki and an event space for up to 200 guests. Roomers in Baden-Baden is a member of Autograph Collection Hotels. Freshly arrived at The Pure and Bristol Hotel: The madly great care products from Malin+Goetz! The two New Yorkers Matthew Malin and Andrew Goetz have been creating high-quality and effective skincare products that are easy to apply with an equally simple and effective design. They develop all their recipes themselves and produce their products in the vicinity of New York. The locality of their production companies and their loyalty to them is not only important to them, but a corporate philosophy. This proximity to production enables them not only to control and secure their quality, but also to promote local businesses. The carefully selected ingredients of the Malin+Goetz products are fully committed to skin tolerance and bring a pleasant natural fragrance that quickly volatilizes and clears the way for a scent of your own choice. In 2004, they opened their first shop in New York’s Chelsea district, which, while fully modern, still resembled the neighborhood’s traditional pharmacies. After 3 years, the demand for Malin+Goetz products overcame the opportunities of the small shop and they began to expand. Today, the two lead 8 stores in London, New York, Los Angeles and Santa Monica, serving consumers and businesses around the world with their skin-friendly care products. Great news from the Mixology Awards: Legendary Roomers Bar in Frankfurt is “HOTELBAR OF THE YEAR 2017”! The best of the best of german-speaking bar’s scene gathered for the grand gala of Mixology Bar Awards in Berlin last night. Among the top 5 nominees for the “Bar of the year” the Roomers Bar competed against Monkey Bar 25hours Berlin, Curtain Club at the Ritz Carlton Berlin, Bar am Steinplatz Berlin and Widder Bar Zurich. For the first time Roomers Bar brought the award to Frankfurt! After the team was awarded to the “Bar team of the year” in 2010, we are now very proud again and want to thank all colleagues, guests and supporters! The Gekko family grows and grows – don’t miss a single highlight: Whether seasonal parties, news from the companies or events, here you get a quick overview and have gathered all important infos compact.